Helen Loggie’s “Hosanna” is an etching made in 1960, and is part of the new exhibit at Cascadia Art Museum in Edmonds. Woodland Reverie actually features four women: Three Bellingham artists — Loggie (1895 to 1976), Elizabeth Colborne (1885 to 1948) and Z. Vanessa Helder (1904 to 1968) — and award-winning contemporary artist Donna Leavitt of Edmonds. All of them love or loved trees. Loggie is the focus, and for good reason. Years before the well-known Northwest artists Morris Graves and Mark Tobey took New York by storm, Loggie’s landscape work was an attraction in New York galleries. People there knew relatively little about the flora and fauna of the Northwest and the interest was great. Cascadia curator David Martin has yet another hit with this exhibit. Many of the works haven’t been seen for decades and others have never been publicly shown before. Cascadia’s hallmark is its fierce focus on Northwest art from the late 1880s through the 1970s. Except for Edmonds-born Guy Anderson; Granite Falls-based Kenneth Callahan; Graves, who lived in Woodway; and Tobey in Seattle, not many regional museums or galleries have focused on the artists of this period until Cascadia opened its doors a few years ago. ■ “After the Rain, Laurel Hill” by Helder is on loan from the Lynden Library. Vanessa Helder was born in Lynden. In the late 1940s, a benefit tea and other donations raised $90 to buy one of Helder’s paintings for the Lynden Library. Helder, who had exhibited in New York City and sold her work for much more money, was deeply touched by the efforts of her hometown. “Can you possibly imagine how I feel?” she wrote in a letter to a friend. “This is one of the most exciting things in my life.” See also Helder’s magnolia blossoms and her Bellingham Bay mill scene. ■ Three of Colborne’s colorful prints. 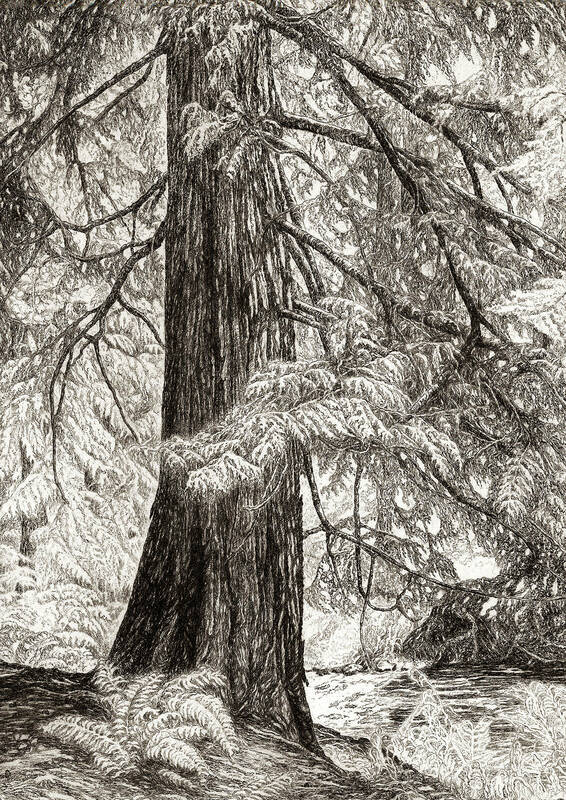 Her trees, such as in the woodcut “Red Cedars Old & New” are magnificent. In the second room, see Loggie’s detailed drawings (do not forget your reading glasses) and prints, including “Flowering Madrona” from 1941 and “Hosanna” from 1960. Also take note of her study drawings and their resulting etchings, as well as a couple of unfinished drawings, which show the viewer the process she undertook to make these highly detailed works. Drawings and prints of Mount Shuksan, daffodils, ferns, wild lilies and lovely twisted trees such as “Herself,” circa 1953, are representative of Loggie’s talents. “You can tell she was, probably even as a little kid, obsessed with delicate landscape details,” Martin said. In room three, see large-scale contemporary tree drawings by Leavitt. These large drawings are in parts, on single sheets of paper, so when the viewer walks by, the papers rustle like leaves. As a Peace Corps volunteer Leavitt lived in a tree house for a time. She did not have large pieces of paper on which to draw her tree, Martin said. That’s how her style got started. “Donna’s pieces are nicely compatible with Helen’s,” he said. Cascadia Art Museum’s “Woodland Reverie: The Art of Helen Loggie” is showing 11 a.m. to 6 p.m., Wednesdays through Sundays, April 11 through June 30. The museum is at 190 Sunset, Edmonds. For more information, including admission prices, go to www.cascadiaartmuseum.org. Elizabeth Colborne’s “Red Cedars Old & New,” a 1933 color woodcut, part of the “Woodland Reverie” exhibit at Cascadia Art Museum in Edmonds. Helen Loggie’s pastel “Madrona Trees” from about 1918, before her career turned to etching. Loggie was from Bellingham.